You know, when I look at the Scottish independence debate from over here. 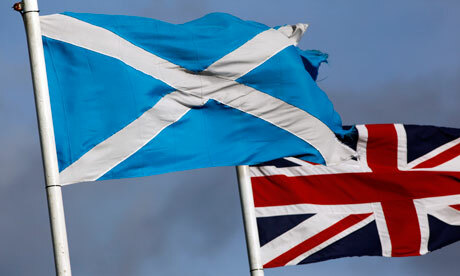 I don't see Nationalism versus Unionism. The media portrays it as such, but it's a falsehood because they've already pinned their colours to one side. What I see, and what is more evident as the weeks go by, is that this is merely nationalism versus nationalism. Scottish nationalism versus British nationalism. The rhetoric, especially from Labour these days has particularly strong nationalistic undertones( and its expected that the Scottish Nationalist party would have their own nationalistic undertones, so that's not really worth mentioning) when you dig through the pseudo-socialist "we're all in this together" malarkey that hasn't been true since Tony Blair and Gordon Brown made their New Labour pact in 1994. The thing about British nationalism though...is that its a toxic brand. It's the kind of thing that the Daily Heil makes a fortune peddling. Its anti-progressive at its heart. Its reactionary at its core. That's what makes Labour's continual forays into such nationalism concerning. Its also fairly untenable to keep attacking a nationalist position when your own position exploits a similar strain of nationalism. Compare them to the Liberals for example. The Liberal Democrats are wet blankets, but credit should be given where its due. They are fairly internationalist in their view points, though you do get the occasional mad-hatters like Tavish "Shetland and Orkney want to stay British!!!!!" Scott. They tend to not rely heavily on British nationalism in their arguments for the union, as other parties do, and see European federalism as the future, rather than petty nationalism. Fighting fire with fire just burns the house down. Labour would do well to remember that because from where I am standing, the Union is burning faster than magnesium ribbon on a naked flame. What can I say? I'm a Scottish guy who has been living abroad for a few years now.